Quality Product, Quality Service, Speedy Freight, I will be back. Thanks Cable Chick! Enjoy the freedom of running compatible devices on USB power - away from the teathers of wall power outlets! To power your 5V DC devices from any powered USB port, all you need to do is check your device required 500mA or less, and it has a 5.5mm plug barrel socket! Sick of all those big power transformers hogging a socket on your powerboard just to charge a phone dock or run a tiny video converter? Well, now you have the option to power those devices via USB! 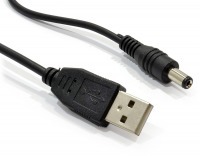 Any small electronic device which can accept a 5.5mm Barrel Plug and runs of 5V / 500mA power is suitable for connection to a USB socket using this cable. A great option for installing small electronics in caravans where 240v power sockets aren't availble. Works with many of our single-output converters like our VGA to DVI Converter and our HDMI Audio Extractor. Voltage Compatibility: Many large and multi-output home theatre electronics require 12V or higher voltage to operate. This cable is only suitable for DC 5v electronics accepting the 5.5mm diameter plug. Check your device's power pack or manual to ensure it accepts 5 volt power. USB Source Compatibility: Please note that many mobile devices - including laptops, tablets and smartphones - do not output the enough power over USB to power some devices due to their extreme power-saving measures. We recommend USB power sources including Desktop PCs, USB Wall Charging Outlets, and USB Ports found on TVs. Answer: "Yes. +ve terminal is inside the pin, while the -ve terminal is the sleeve. This is the industry standard for USB power." Answer: "Yes, the cable can safely carry up to 2 amps, but your source device must output the 1.4A or more that you require as well. (Some basic USB wall chargers and computer USB sockets only support 0.5 to 1 Amp, and that's what the cable will pass on)"
Just wanted to let you know I have never experienced such quick and efficient service. the Cable Chick rocks and I will be recommending you to everyone.